To Mrs. Gemma Hanrath, in appreciation for her assistance in preparing our trips to South America. The drainage of the Río Grande in southern Peru - the heartland of the well-known Nasca Culture - is very rich in rock art. However, up to 2009 rock art had not yet been reported from the Ingenio Valley. This void was remarkable as - so far - all other major tributaries of the Grande River have yielded rock art sites. Also the extensive archaeological surveys in the Grande drainage by Ana Nieves (2007: Fig. 5.1) and by Elaine Silverman (Silverman 2002 in: Nieves 2007: 69 - note 24) did not reveal any rock art site in the valleys of the Río Ingenio and Río Vizcas. 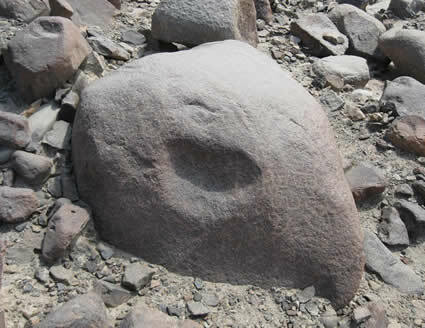 However, in 2009 a number of petroglyph boulders were discovered at Cerro Bogotalla in the Ingenio Valley, while later more petroglyph rocks were reported at other sites in the same valley (Oblitas Bustamante 2009). The petroglyphs of Bogotalla were reported to the scientific world for the first time by Martín Caipo Berrocal in 2009 in Rupestreweb Messages (Caipo Berrocal 2009). A little later a video by Joel Donayre Corzo, David Angulo Corzo and the discoverer Martín Caipo Berrocal was placed on YouTube (Donayre Corzo and Angulo Corzo 2010.). This video showed at least seven of the petroglyph boulders that occur in the Bogotalla petroglyph field. 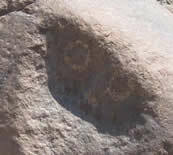 Two mor petroglyph boulders appear in the video, but these have not been found by us. They may have been overlooked by us, or they may be located in an adjacent valley of the Cerro Bogotalla complex or at another place in the Ingenio Valley. that runs from NW to SE. At the spot where the lesser valley joins the main dry valley and on its west bank, the biggest concentration of petroglyph boulders is found, including the key boulder, BOG-001. A third group of four boulders is found on the east bank of the dry valley, on a small natural platform. The petroglyphs are also situated only 6.3 km NE of the eastern fringe of the famous Nasca Lines Complex and it is no surprise that also Cerro Bogotalla is littered with geoglyphs. Only 100 m SSE and downhill of the petroglyph boulders is a small group of linear geoglyphs, while 200 m east (across a ridge east of the petroglyphs) is a group of very complex geoglyphs. Also 1200 m NNW and 1000 m NNE are extensive groups of mainly linear geoglyphs. The whole area is crisscrossed by narrow ancient paths. All these features are easily visible with Google Earth. There are many more areas with suitable boulders on these southern and eastern slopes of Cerro Bogotalla, but so far only a small sector proved to have boulders with petroglyph. This makes one wonder why this specific spot and especially these boulders had been chosen by the ancient Andeans to execute their sacred images upon. The site is no different to many other Andean rock art sites. Often such rock art sites are located a short distance from a river at a spot where suitable rock surfaces occur. Yet, there is something special about this site and particularly about the boulder BOG-001 that may explain the choice of the ancient Andeans. Most importantly, the images on BOG-001 comprise a faint Formative Period design, which allegedly is an anomaly in this area once dominated by the Paracas and Nasca cultures. It is a frontally depicted head, face or mask featuring rectangular eyes with - hardly discernable - an eccentric pupil each. Above the head are faint lines and circles that once may have formed a possible headgear. The mouth seems to be agnatic and is characterised by at least two large, pointed ‘fangs’ - one at each corner of the mouth - and possibly three smaller, rounded teeth; all protruding downwards from the head/jaw (actually, an upper lip is not visible). As I object to the classification of such images as ‘Chavín’ or ‘chavinoid’, I introduced in my recent book ‘The Chavín Controversy’ the more appropriate acronym MSC-style (Van Hoek 2011). The combination of the three capitals indicates the possible influence from the Manchay, Sechín and Cupisnique ‘cultures’ (the last ‘C’ of the MSC-acronym may also be read as Chavín). By using the contraction ‘MSC-style’, I try to avoid ascribing a certain image exclusively to one specific ‘culture’, simultaneously allowing for influences other than Manchay, Sechín and Cupisnique to be (even collectively!) responsible for a final image. For example, local influences and personal idiosyncrasies cannot be ruled out. In this way it is also possible to avoid that a complete rock art site is labelled as ‘Chavín’ or Chavinoid. It is even more likely that the imagery at a major rock art site (like Bogotalla) reflects several cultural influences. There are a few more boulders with (possible) MSC-style images at Bogotalla, but the design on BOG-001 is the most convincing example. A second indication of the importance of boulder BOG-001 is the fact that 15 of the 29 petroglyph boulders that my wife Elles and I recorded at Bogotalla surround the major boulder (BOG-001). Yet, there are many suitable boulders in the area. Why then was this specific boulder chosen by the manufacturer of the MSC-style design? The answer is given by the natural shape of the major boulder, BOG-001. The smooth and rounded boulder has an almost horizontal upper surface and an almost vertical southern panel which measures about 115 cm in width by 75 cm in height. It is the south facing panel which provides the answer. In the field I noticed that the large natural depression (30 cm in height by 44 cm in width) on the south side of the smooth surface actually looked like a large eye. Moreover, the dark shadow cast by the upper rim of the depression created an eccentric pupil above the more clearly illuminated lower part of the depression (compare this with a similar situation at the free-standing stone pillar - Monolith 46-1 - at Kuntur Wasi in the Jequetepeque drainage). As this effect is visible during a rather long time of the day (preferably around noon) and long periods of the year (especially spring and autumn), it may also have been noticed by the ancient Andeans who once lived in the area. But there is more. Stepping away from boulder BOG-001 in order to make a photograph of the phenomenon of the naturally-created eccentric eye (Figure 1), I noticed something even more remarkable. From a distance the whole boulder looked like a huge head of a bird of prey looking to the east. This effect is only appreciated when viewed from the south. No lower jaw is present, but this seems to fit in the Formative Period preference to depict agnatic faces, which is reflected by the petroglyph of an agnatic face on BOG-001. head with an eccentric eye. Photograph by Maarten van Hoek. I am convinced that the conspicuous, natural three-dimensionality of the BOG-001 boulder has triggered the ancient Andeans to decorate the stone with their sacred images. Indeed, the whole surface of BOG-001 seems to have been decorated, but the upper surface is so much weathered that only very faintly a few lines are visible at the moment. The better visible MSC-style ‘face’ is found on the beak of the ‘bird’, near the natural eye. At a later stage perhaps at least 15 of the surrounding boulders were also decorated to further sanctify the spot. Several of the 15 satellite-boulders encircling BOG-001 and others in the Bogotalla boulder field feature anthropomorphs in a distinct local style (Paracas-Nasca). Also another boulder at Bogotalla, BOG-029, seems to have been chosen because of the combination of light and shadow. BOG-029 has a small natural depression on its south facing surface. In the darker area have been pecked two circles (eyes?!) and a small horizontal groove (mouth?!). All these elements give the dark-light area of this part of the stone the impression of a face or mask. It seems rather convincing that also BOG-029 was chosen and decorated because of the combination of shade and light by the ancient Andeans to represent a face or mask. Valley of southern Peru. Photograph by Maarten van Hoek. The idea that specific boulders were selected for petroglyph production because their natural three-dimensionality reminded ancient Andeans of animals that were important to them, is not new. 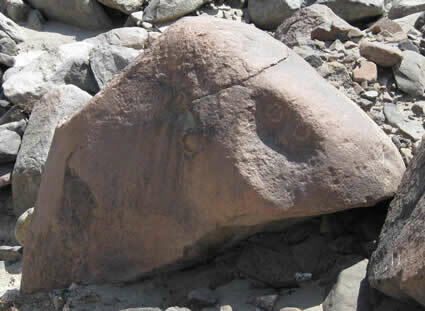 In 2004, the eminent Peruvian rock art investigator Cristóbal Campana Delgado published an article about Alto de la Guitarra in the north of Peru in which he discussed several petroglyph boulders that proved to have specific natural biomorphic shapes (looking for example like a snake, a frog, a feline and a bird’s head). Campana Delgado argues: ‘Reconoce las dos formas exteriores más simples para su diferenciación: bidimensionales y tridimensionales. Existen imágenes bidimensionales o grabadas sobre la superficie de la roca, siendo éstas las más comunes. En cambio hay otras que son tridimensionales o en “bulto”. Así, aprovechan la forma casual de la roca a la que se le agrega algunos rasgos de diseño pictográfico percutiéndola’ (Campana Delgado 2004 - 2005). Campana Delgado was one of the first rock art investigators who argued that specific stones were especially selected to be engraved with petroglyphs because of the natural biomorphic shape of those stones. Importantly, the images on those stones at Alto de la Guitarra often proved to be of the MSCstyle. It may therefore be argued that the selection of stones displaying a natural, threedimensional biomorphic shape to receive the sacred images of the ancient Andeans is a property of the Formative Period. The Bogotalla petroglyph field is an important addition to the enormous collection of Andean rock art. Boulder BOG-001 (and perhaps a few other boulders) features a rare MSC-style petroglyph. Thus Bogotalla is the second site in the Rio Grande drainage with MSC-style imagery. The other example occurs on boulder CHI-004 at Chichitarra, 21 km NNW of Bogotalla in the Palpa Valley. However, the Bogotalla MSC-image is not the southernmost example of an MSC-style image. Further examples have been reported at Chillihuay and perhaps Alto de Pitis (full details about many of the MSC-style petroglyphs in the Andes are available in: Van Hoek 2011). The most rewarding conclusion of the Bogotalla survey was that - in general - it is confirmed that the natural, three-dimensional shape of a boulder may have been the reason to select the boulder to create two-dimensional rock art imagery upon its surface. By doing this, the site became sanctified. At later stages other petroglyphs were added to adjacent boulders to further sanctify the site. Acknowledgement: I would like to thank my wife Elles for her assistance in recording the petroglyphs at Bogotalla. explain the occurrence of two-dimensional petroglyphs on that rock. Nieves, A. C. 2007. Between the river and the pampa: a contextual approach to the rock art of the Nasca Valley (Grande River system), Department of Ica, Peru. The University of Texas at Austin, U.S.A.